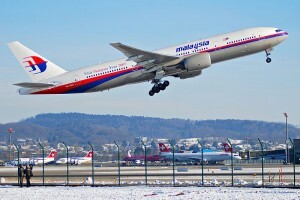 A Malaysia Airlines Boeing 777 plane has reportedly crashed in Ukraine near Russian border. The plane, MH17, was flying from Amsterdam to Kuala Lumpur with 283 passengers and 15 crew members. 6.15pm: MH17 departs from Amsterdam, the Netherlands, carrying 280 passengers and 15 crew. 10.15pm: MAS confirms it received notification from Ukrainian Air Traffic Control (ATC) that it had lost contact with MH17 at 30km from Tamak waypoint, approximately 50km from the Russia-Ukraine border. 11.40pm: Moscow based news agency Interfax says Malaysian passenger airliner was shot down at altitude of 10 km above Eastern Ukraine. > They confirmed the location of a burning Malaysian plane in Eastern Ukraine. > The Ukrainian Interior Ministry also confirmed that all passengers and crew are dead. The aircraft was “shot down” while cruising at an altitude of 30,000ft. > Igor Strelkov, the military commander of pro-Russia separatists, posted on social media shortly before MH17’s crash that rebel forces had brought down an Antonov An-26, an aircraft commonly used by Ukrainian forces, in the same area. 12.03am: Ukrainian Prime Minister Arseniy Yatsenyuk orders an investigation into the crash. 12.18am: Ukrainian officials at the location of the crash confirm at least 100 bodies are found at the location and that body parts were scattered up to 15km from the site. 12.30am: Both Ukrainian authorities and rebel leaders deny shooting down MH17. A ground-to-air missile was the suspected to have brought down the aircraft. > Russian President Vladimir Putin is in contact with United States president Barrack Obama on the crash, according to RIA news agency. 12.45am: Location of the crash site was revealed to be the settlement of Grabovo in the Donetsk region. 2.10am: At least four French nationals were onboard MH17, says French foreign minister Laurent Fabius. 2.28am: Interfax reports that Pro-Russian separatists claim to have found MH17’s black box. 4.15am: The aircraft’s flight route was declared safe by the International Civil Aviation Organisation and the International Air Transportation Association stated that the airspace the aircraft was traversing was not subject to restrictions, says Prime Minister Najib Tun Razak at a press conference. > MAS confirms no distress call was made by MH17, he says. > According to information provided by Kiev Air Traffic Control, the location of the plane’s emergency locator beacon is 48 degrees 7 minutes and 23 seconds North; and 38 degrees 31 minutes and 33 seconds East. > Ukrainian authorities believe that the plane was shot down. However, Malaysia is unable to verify the cause of this tragedy, says Najib. > Malaysia will endeavour to “find out precisely what happened to this flight” and promises that any perpetrators will be brought to justice. > Government is dispatching a special flight to Kiev, carrying a special Malaysian disaster assistance and rescue team as well as a medical team. > Emergency operations centres have been established and Malaysian officials are in constant contact with counterparts in Ukraine and elsewhere, says the Prime Minister. > Ukraine President Petro Poroshenko has pledged that there will be a full, thorough and independent investigation, says Najib. > Ukraine will negotiate with rebels in the east of the country in order to establish a humanitarian corridor to the crash site. 6.10am: Crashed MH17 scheduled to arrive in Kuala Lumpur International Airport (KLIA), Malaysia. 7.30am: MAS says that all its flights to and from Europe will take alternative routes to avoid the usual path where flight MH17 went down in eastern Ukraine. 7.30am: MAS confirms that MH17 was carrying a total of 298 people – 283 passengers, including three infants of various nationalities, and 15 Malaysian crew members – and not 295, as previously reported.